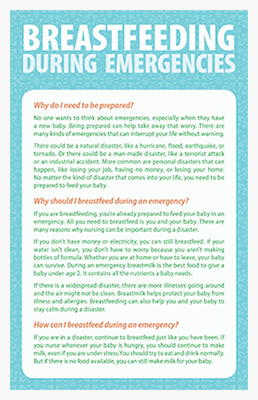 These Emergency Tip Cards include the information contained in chapter 10 of the 2013 Full Color Edition of Why Should I Nurse My Baby? in a two-sided postcard format. It helps moms know why and how to plan ahead for when emergencies happen. Whether natural disaster, financial crisis or any other unexpected situation, she will be prepared to take care of and feed her baby.